Mrs. Weiseth really wants to have a coffee date with you. 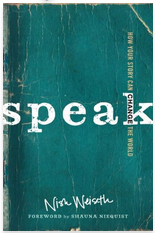 In her new book, Speak, she illustrates the power of storytelling. We all have a story to tell, and we do not realize how much power it conceals. Alongside a series of anecdotal vignettes, including some highlighted stories from her successful collaborative blog “A Deeper Story,” she urges her readers to be vulnerable, to take a risk and tell someone the story in their hearts. This small act of vulnerability can shatter interpersonal barriers and effect positive change in relationships, communities, and, ultimately, the world. Speak is an easy sell. Mrs. Weiseth’s effortless prose is immediately inviting, sprinkled with smart quips and devoid of pretension. I felt like I was catching up with an old friend, not realizing that it was past closing time and the café owner was putting up the chairs. Only until I had breezed through the book did the potent message gel in my mind. It is childishly simple, but of such relevance and import—especially to Evangelical Christians—that I could not stop ruminating on it. Mrs. Weiseth has a big heart that aches for the Church’s missteps, and out of frustrated love she often shines the spotlight on its ugliness. Yet, with earnestness and grace, she never fails to look to Jesus as her exemplar. His story changed the world, and so can yours.